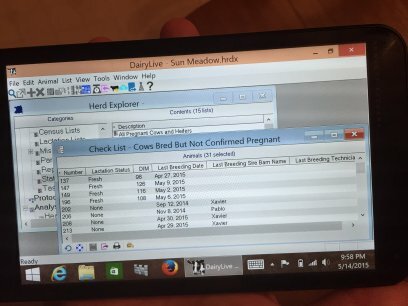 Did you know that you can run the full version of DairyLive on a tablet computer that costs less than $100? There are several models that can be purchased that are more than adequate to run DairyLive 5.0. DairyLive has a very small "footprint", that is, it doesn't take much memory or disk space, so it's perfect for running on small inexpensive computers. Here's what you need: A tablet computer running Windows 8.1 or Windows 10 (not the RT version of Windows). Either 32-bit or 64-bit will work, and you need only a modest amount of memory and disk space. Check out the HP Stream 7 Tablet 32 GB Windows 8.1 Signature Edition, which is available on Amazon.com for under $80. It has a seven inch screen and 32 GB of storage. There are other options, too, and there are larger tablets too that cost more.